An increasing number of people are moving towards smaller living. Smaller ecological footprint, smaller spending … smaller home. Whether your reasons for living small are by choice or by necessity, strategically placed lighting can create the illusion of a larger space. Recessed Lights — In a small room where floor space can be a precious commodity, floor lamps probably won’t make the cut. Large light fixtures hanging from the ceiling can break up the room and make it seem smaller – an advantage in open living areas, but quite the opposite in an already tight space. Low-profile recessed lights solve this problem by creating a clean line of sight that can shine bright for tasks or be dimmed for a family movie night. Track Lights — Track lights take up much less visual space than traditional fixtures, but can still make a decorative statement in the home. 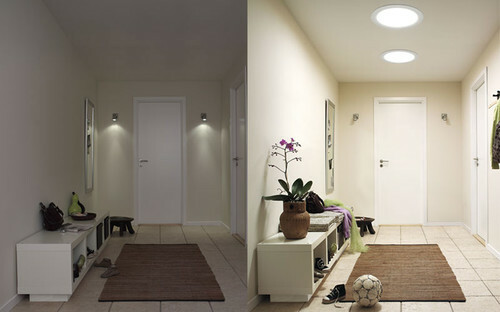 Each individual light on the track can be adjusted to bounce off of walls and ceilings, or lighten up a shadowed corner. When you combine the flexibility of track lighting with the low profile of recessed lighting, every corner of a room is brightly lit without compromising space or style. Colors & Accessories — After you’ve put your perfect lighting strategy into place, expand on it with bright colors and artfully placed accessories. A large, strategically positioned mirror makes the space seem wider and longer, and reflects light back into the room. When considering paint choices, Freshome recommends using light blues, greens, light grays and neutrals to create a bright and airy feel. Whether shimmering, sparkling or softly glowing, incorporating light into your holiday mantle design is an instant way to add glitz. We have collected some gorgeous examples from Houzz designers where light played a role in creative holiday mantle decor, as well as simple ideas to make your mantle shine. Think outside the box (er, mantle) — If you don’t have a fireplace or mantle in your home, recreate the look easily and with just as much glamour using a large shelf or entry table. Go outside! — A quick trip to the back yard can reap huge rewards for your holiday decor. Branches, twigs, holly and pinecones add to a rustic look. Borrow baubles from the tree — Extend your current theme by taking a handful of ornaments from the tree and scattering them throughout your design. 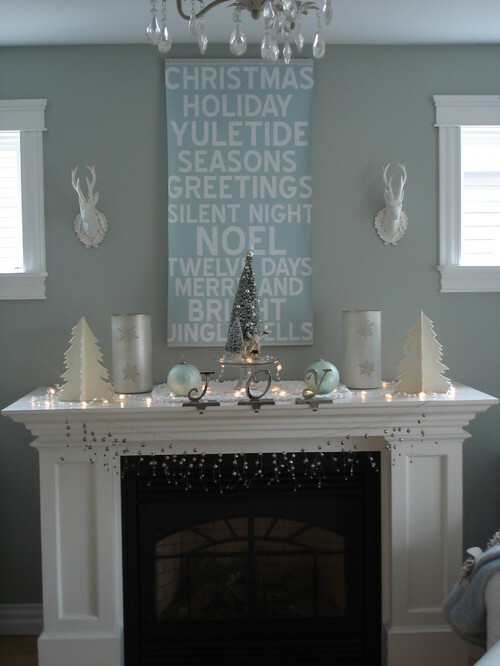 Get crafty – You’d be amazed at what a can of silver or gold spray paint and some glitter will do to make the mantle sparkle. Christmas, Hanukkah, Valentine’s Day, Independence Day and even Halloween … No holiday is immune to the spell of twinkling of lights. Since July 2009, we’ve written over 600 blog posts. It comes as no surprise that a large majority of them have centered around a holiday. If you are one of the many folks hauling out holiday lights this weekend, you’ll appreciate this round-up of 6 Popular Holiday Lighting How-To Blog Posts that we’ve accumulated throughout the years. Get out your notepads because we’re building a strategy in this Learn article with loads of tips on creating the ultimate holiday lighting plan. The conclusion of Daylight Saving time this past weekend means the night comes a little earlier. Logic may tell you that the longer and darker evenings will make falling asleep easier. However, even though the nights are longer we are also using smartphones, tablets and HDTV’s more and more in the 21st Century, particularly at night. Some scientists believe that Mr. Sandman has a new nemesis – the little blue light in all of these new-fangled devices. Keep your Trick-or-Treaters safe with portable lights on Halloween that can double as costume accessories!